Marcus Antonius & Cleopatra VII. 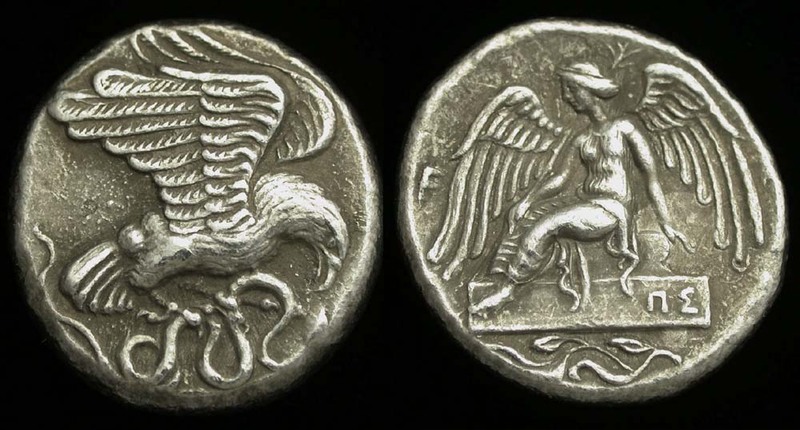 Denarius (tin coin replica) struck in c. 34 BC. OBV/ CLEOPATRA REGINAE REGVM FILIORVM REGVM, her diad. bust right, prow before. REV/ ANTONI ARMENIA DEVICTA, His head right, Armenian tiara behind. Cleopatra (Greek: Κλεοπάτρα Φιλοπάτωρ; January 69 BC-November 30, 30 BC) was a Hellenistic co-ruler of Egypt with her father (Ptolemy XII Auletes) and later with her brothers/husbands Ptolemy XIII and Ptolemy XIV. She later became the supreme ruler of Egypt, consummated a liaison with Gaius Julius Caesar that solidified her grip on the throne, and, after Caesar's assassination, aligned with Mark Antony, with whom she produced twins. In all, Cleopatra had four children, one by Caesar (Caesarion) and three by Antony (Cleopatra Selene, Alexander Helios, Ptolemy Philadelphus). Her unions with her brothers produced no children: it is possible that they were never consummated; in any case, they were not close. Her reign marks the final end of the Hellenistic and the beginning of the Roman era in the eastern Mediterranean. She was the last Pharaoh of Ancient Egypt (her son by Julius Caesar, Caesarion, ruled in name only before Augustus had him executed.). After Antony's rival and Caesar's legal heir, Gaius Julius Caesar Octavian (who later became the first Roman Emperor, Augustus), brought the might of Rome against Egypt, it is said that Cleopatra took her own life on August 12, 30 BC, allegedly by means of an asp. Her legacy survives in the form of numerous dramatizations of her story, including William Shakespeare's Antony and Cleopatra and several modern films. Cleopatra was a direct descendant of Alexander's general, Ptolemy I Soter, son of Arsinoe and Lacus, both of Macedon. A Greek by language and culture, Cleopatra is reputed to have been the first member of her family in their 300-year reign in Egypt to have learned the Egyptian language.